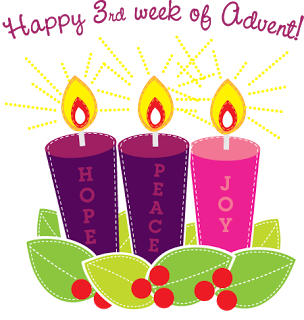 Today marks the 3rd week of Advent. Today Jesus talks about John the Baptist. He told about the coming of Jesus. We also know from the scripture that John was the son of Mary’s cousin Elizabeth. John told the people to prepare the way for the coming of God. This week we light the third candle. This candle is pink. It symbolizes joy. Think about the joy that comes from the love of Jesus. May we spread the joy of Jesus’ love with everyone we meet. In this Advent season, we can plan weekly actions that help us to prepare for the coming of Jesus. How can you open your heart to get ready for Jesus?